Some people would find it strange but I enjoy sleeping in the wide boy bed chair in the back of the car. I just crack the window open to allow a good feed of air. I put the radio on and listen to radio 4 for a while, in fact one hour as the radio is on a timer. I set the alarm for 6.45am where I can use the facilities in the local car park and then head to Andy Bowne’s Avon Angling for fresh supplies of maggots. Sometimes Martine is late in arriving but hey ho only by a few minutes. I was in a real two and eight. Should I fish the Avon or the Stour. Someone once said to me that the Avon doesn’t fish well after frosts, so it was the Stour again. This time I was second again in arriving to the car park. However I could see the angler downstream and away from where I was fishing. There was no frost this morning and the temperature was already 6c with a steady drizzle. I started in one swim where conditions looked great but the chub where not at home, or feeding. I gave it 90 minutes with out a touch. 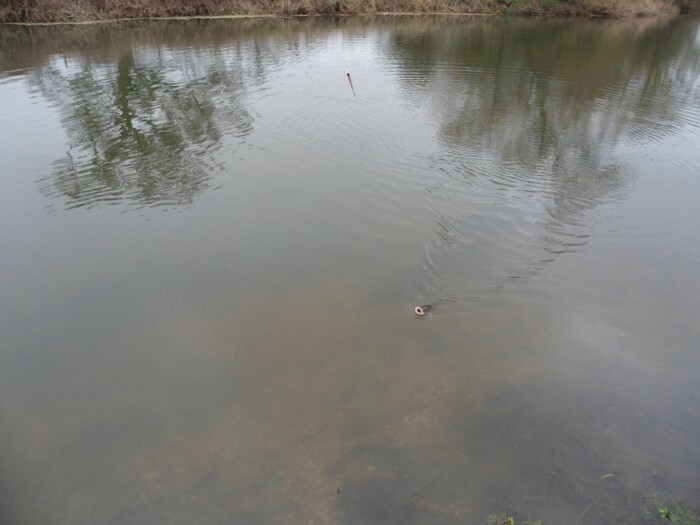 I tried another swim which is normally full of chub and again after 90 minutes trotting down nothing came along. So that was 3 hours wasted. I decided to move downstream to some slightly deeper water of 4ft deep with a steady glide through. On the far bank was a willow with branches trailing in the river. This I thought would be the place to hid if I were a chub giving plenty of cover. Having arrived at 11.30am I was soon firing the maggots out just upstream from the willow trying to entice the chub out from the entangled mass of branches. Nothing other than the odd minnow, and it was the odd one gave any indication of fish present. I had never fished the swim before but it looked sooooooooo good. The aim was to trot the float as close to the willow as possible then if a chub took the bait then walk back into the field pulling it away from the snags. 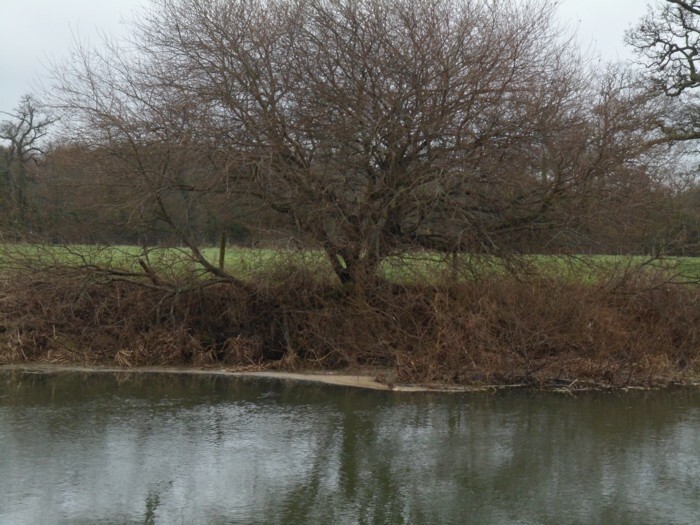 Even though the temperatures had increased the wind had likewise and proved to problematical in trying to control the float as it passed downstream. Not perturbed I continued feeding the swim knowing it looked too good. At 12.30 the float disappeared again where is shouldn’t have done. The strike met with very solid resistance and a pulling back. Swiftly I pulled as far as possible fearing for the hooklink the fish luckily came in my direction into mid river. Now it was mine, or so I thought as it powered towards the snag of the willow. More pressure and moving back into the field with the rod in a most impressive curve (parallel to the ground) and soon had it in midstream again. Luck was on my side. You can never count on these most cunning of fish not to find a nearside snag or piece of weed and get loose. After a good 3 or 4 minutes there she was laying in the net, mine! It’s terrible when you need to put a weight on a fish but that’s the name of the game, 5lbs 9oz. So that was it a good fish again on light tackle. The next action came at 1pm when I hooked a small chub of about 2lbs. So I Don’t think I would be messing around taking photo’s if this were a 6lber.These chub are good fun to play on such light tackle. Then at 1.25pm I just lightly hooked another fish which came off after just a split second. The weather was warming and I had to take off my coat to continue fishing. 1.35pm I hooked one more chub which gave me a merry old dance around again. I should say that if you have not tried this style of fishing before book a session with me and lets see what we can do. This was a slightly smaller fish of 4lbs 2oz, perfect in every way. Then again at 2.10pm the float disappeared further down past the willow and sure enough I hooked into another chub which was under control quickly and was 2lbs 12oz. My thoughts were that 4 chub had been taken from the swim, could it hold one more. 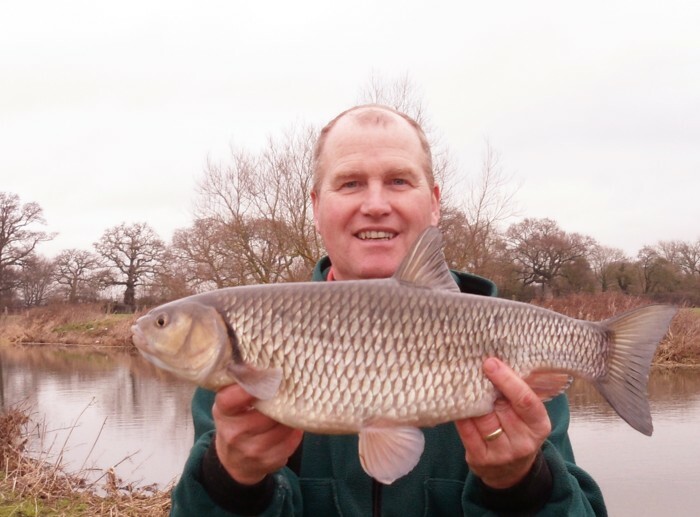 At 3.00pm the answer came with one more chub that put up the best fight of the lot. It almost made it to the willow branches a good few times and those lunges took the rod to the limits when held parallel to the ground. The only thing I find difficult is judging where the float is in relation to the river when doing this. 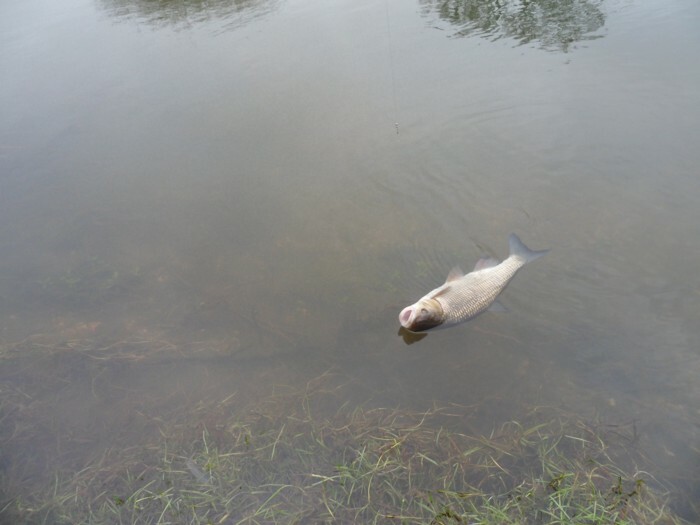 By raising the rod the line shows where the float is but then concern sets in because it is often close to the sang. When I gain some line (enough to lift the rod) I hope the chub is clear of the snags.This one was no disappointment. 5lbs 2oz perfect chub. I continued fishing however no more had come my way even as the light was fading. My last action was at 6pm when a pike attacked the boilie and bite through the braid. Oh bugger! This entry was posted on Friday, January 20th, 2012 at 12:58 am	and is filed under Uncategorized. You can follow any responses to this entry through the RSS 2.0 feed. Both comments and pings are currently closed.